The recent arrival of a company of Hawaii-based Marines in Darwin, Australia, stirred up some unfavorable sentiments on the continent and around the region. Now comes former Australian Prime Minister Malcolm Fraser, who apparently is quite unhappy about seeing any more Marines Down Under. The rotations, which will send 2,500 leathernecks in six-month rotations to Darwin by 2016, are part of the broader U.S.”pivot” refocusing on all things in the Asia-Pacific region. Top U.S.military officials have said no new permanent bases are planned in the Pacific region, where they already are looking at a reposturing of military forces. But Fraser doesn’t buy it. “For America to say that 2,500 troops do not constitute a base is nonsense, indeed a fabrication,” he wrote. 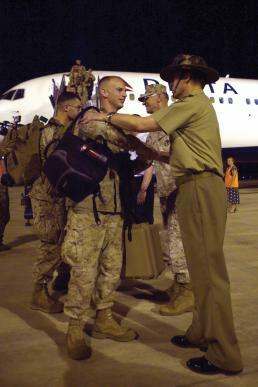 Meanwhile, the men of Fox Company, 2nd Battalion, 3rd Marines, landed in the Northern Territory or the “Top End” as it’s known locally earlier this month to start training with their Australian counterparts at military ranges in the area as military commanders with III Marine Expeditionary Force met with local leaders. Top-level visits to the region include Navy Secretary Ray Mabus, and members of Australia’s parliament met with Marines and sailors aboard dock landing ship Pearl Harbor, currently deployed with 11th Marine Expeditionary Unit and Makin Island Amphibious Ready Group. Hey all. Please disregard the negative comments made by one of our ex prime ministers. I’m a member of the Aussie Air Force and we have worked with you guys forever, we get along great and what a politician says does not reflect our relationship at the coal face, or at the bar having a beer for that matter. Cheers, see you soon. !